Discussion in 'SWNN News Feed' started by SWNN Probe, Jun 4, 2018. 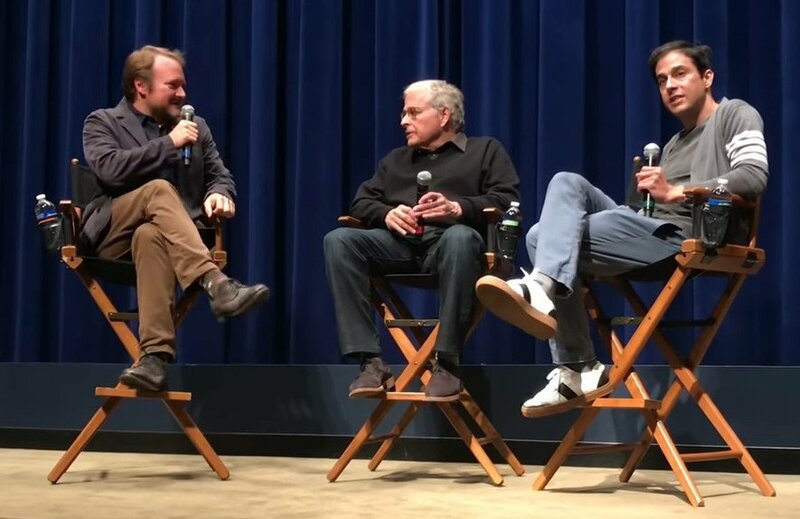 In a new Q&amp;A session hosted by The Last Jedi director Rian Johnson, writers Lawrence and Jon Kasdan discussed their experience writing the script for Solo: A Star Wars Story, revealing some interesting behind the scenes information about the troublesome production and sharing interesting details about some of the movie's story elements. The Q&amp;A is really interesting. The two writers spoke about a variety of topics regarding the production and story of Solo: A Star Wars Story, including the director change, Kathleen Kennedy's role, Darth Maul, and more. Perhaps the most interesting topic was why they decided to recast the role of the villain Dryden Vos. As you know, initially the role should have been played by Michael Kenneth Williams, but later he was replaced by Paul Bettany. In the initial script, while Chris and Phil were still involved, Vos was a lion-looking alien. As the script evolved after Ron Howard came aboard this concept was changed since it would have looked strange for Qi'ra to fall for a 'cowardly lion' opposed to the good-looking Han. They knew they were going to shoot all the scenes with Vos again, and they went for Paul Bettany, who on the other hand was too good looking, and that's why they came up with the scars. Also, Rian Johnson spoke about his experience on Twitter after the mixed reactions to The Last Jedi and talked briefly about his upcoming Star Wars trilogy, which obviously is very much still happening. No offence to Michael but Paul did a good job. I wonder why they decided not to continue in the tradition of different species being physically attracted to each other or involved with each other one i.e., Maz/Chewie. etc. etc.. I thought that would have been very star wars like. Plus I wanted to see MKW in a star wars flick. He plays an awesome villain. I'd guess because the push/pull factor would make it seem less realistic. Would she really go for a lion creature over Han? He's handsome, biologically compatible and they have a history. The other is fury, compatibility is up in the air and no real history. It'd either be ridiculous or you'd root for the wrong guy to get the girl. 1. They didn't want an African-American to play the bad guy because of sterotyping and racial profiling. 2. Because English actors are better actors because of their wider range of skills. Englishmen are stereotypically the bad guy in US productions, and are cheaper to hire too. this is where my dislike and cynicism for all things Hollywood (movies in general) comes roaring to the surface like a surfacing... roaring.. thing. Bettany and Howard are friends, and they have worked together before. Bettany has himself read out the text message he sent to Howard hinting at getting him into the SW franchise somehow, and he even read the text back from Howard saying " i'll get back to you ". it's who you know in that world. I think Howard is awesome and i'd like to see him get his teeth into more SW films (from the start would be preferable lol) but it wouldn't shock me in the slightest if he changed the Vos role just to get his friend in.. albeit a trusted big name actor that would be completely bankable. that's all pie in the sky from me, and we'd never hear anyone say that.. but it's a scratch my back and i'll cast you in this industry unfortunately. MKW is a pretty well known actor as well, not as much as Bettany obviously but he's still a reputable name. I mean, I SEE why you would state that, but I don't think that was the situation here especially since there are two other african american actors in other roles in the movie and also a mixed race british actress. I guess she can be considered black. I'm also mixed but I like so be considered mixed because well, I am. To each his/her own. Point is that I don't think it would have been racial profiling due to the presence of other actors of color in the movie. All this is IMO of course. English or not, Paul Bettany is just dope anyway. I've always been a fan of his work. Space Omar Little would have been great. I thought Bettany's Vos was great... seething unpredictability bubbling just under the surface.... not a fan of Bettany in general though so that was a pleasant surprise. Can't say I'm really familiar with MKW's stuff, but I felt stereo-typical British Bad Guy worked quite well here. Pretty sure it was stated that MKW had a scheduling conflict with the reshoots. Is Lawrence Kasdan contribution to Episode 5 (& 6) overrated ?